Long hair mutated during the 1980s, and one result was the mullet – short on top and at the sides, long down the back – sometimes with a mere 'rat’s tail' (one lock of long hair), sometimes a waterfall. 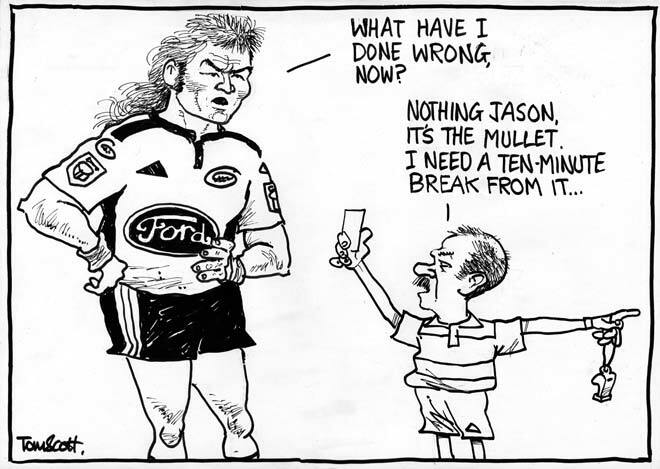 Favoured by working-class men, it was a hairstyle that some found ugly – a feeling expressed by the referee in this cartoon, as he sends rugby player Jason Eaton off the field. The mullet was also very popular with some, and in the 2000s there were many websites devoted to it.